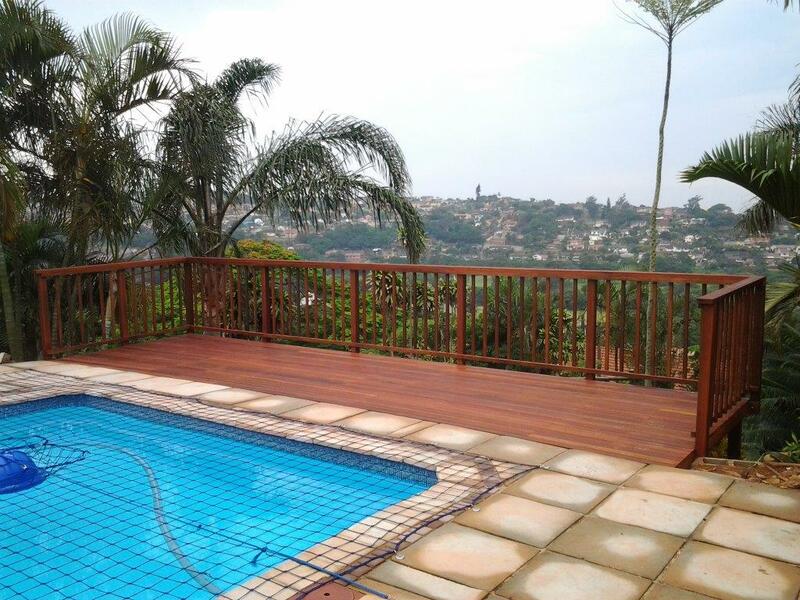 This sundeck we installed in Durban was a relatively simple one to build. The client wanted to extend the area around the pool to create more space. It was a simple cleat, beam and joist system with a fascia beam on the front to attach the balustrade uprights to. There was one challenge in that the retaining wall that runs below the paving next to the pool was not parallel to the paving and as such not parallel to the edge of the deck. A bit of fancy timber work was required with supports, small posts and sleeve anchors which created a substructure that became parallel to the pool, paving and resulted in the sundeck being parallel too. Many of the properties in the Bluff are on situated on steep slopes and decking allows the home owner to reclaim a lot land that would not have been utilised. Terracing the garden is one option and decking over those can add extra space to one’s garden and therefore value to one’s property. I’m not sure if you have noticed, but a garden that has even a few stairs tends not be used as much as a garden that flows on the same level. It is important therefore to design the deck in such a way that you try to keep it all to one plane or the same level. This will result in more of the garden being used. If stairs are necessary one should consider staggering it over a longer length rather than 1m wide stairs. On this build posts had to be set again in the cavities of the loffelstein retaining wall. It was a relatively small deck and only took a few days to complete. I am sure the owners are now enjoying it through the last two summers and it has created a lot more space that they can now use in their garden. It was sealed using a Timberlife Satin Wood Base 28 sealer with a mahogany tint. This sealer soaks into the timber rather than leaving a varnish type finish on the surface. There are two types of this sealer, one for woods of high porosity (pine) and one of timbers of low porosity (balau). Be careful to select the correct one. It is relatively low in wax content compared to their other products which is better for the horizontal surfaces that tend to get hammered by the hot African sun. The higher wax content sealers are good for vertical surfaces such as balustrades, screens, cladding etc. It is very easy to apply as it is very viscous and because it doesn’t dry on the surface, brush marks and runs are impossible to achieve. It simply soaks in. 2 to 3 coats are recommended and in the first year of the decks life it will be necessary to reseal it every 3 to 4 months. As time goes by the maintenance intervals will become longer as the timber is continually being nourished with this sealer. It is inexpensive and is easy to use so re-sealing every 3 or 4 months in the first year is also inexpensive. There is no need to sand the deck before each application. Simply clean it, high pressures clean it if you wish, and re-seal. I will go into more detail in another article on sealing decks and maintaining them as it is a subject that warrants its own platform. Since writing this I have written and article on deck sealing which can be found here. For a free no obligation quote or to discuss the design of your deck, please complete the form below and we will contact you. Or you can call us on 031 – 762 1795. 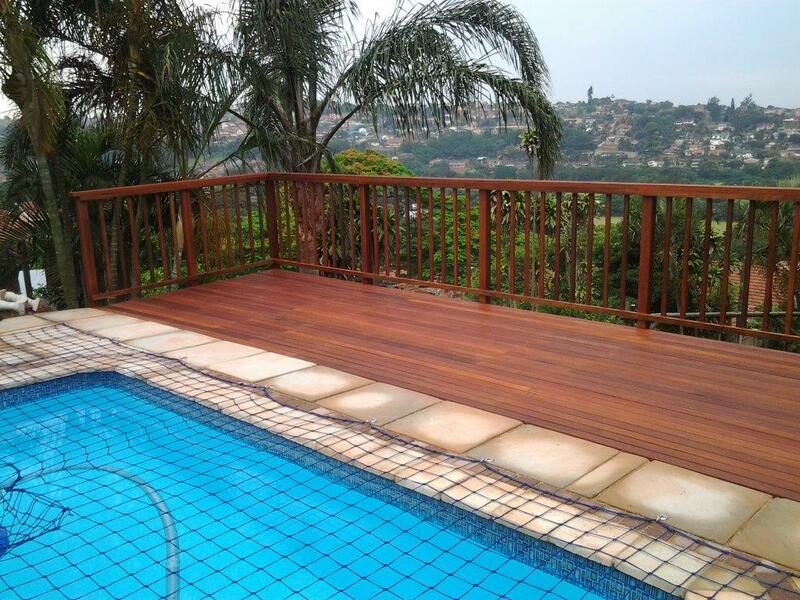 This entry was posted in Durban, Wooden Deck Builder Durban, Wooden Decks, Wooden Pool Decks and tagged Construction and Maintenance, deck, Durban, Garden, Home and Garden, pool decks, Sun Decks, Sundeck, Sundecks Durban, wooden, Wooden Decks by Garrick Dunstan. Bookmark the permalink.